February was a fabulous month transitioning back into our 'school' rhythm. Mr 7 was very ready to get back into a more regular routine after the long unstructured days of summer, and Mr 5 was super excited to begin his first year of "school". 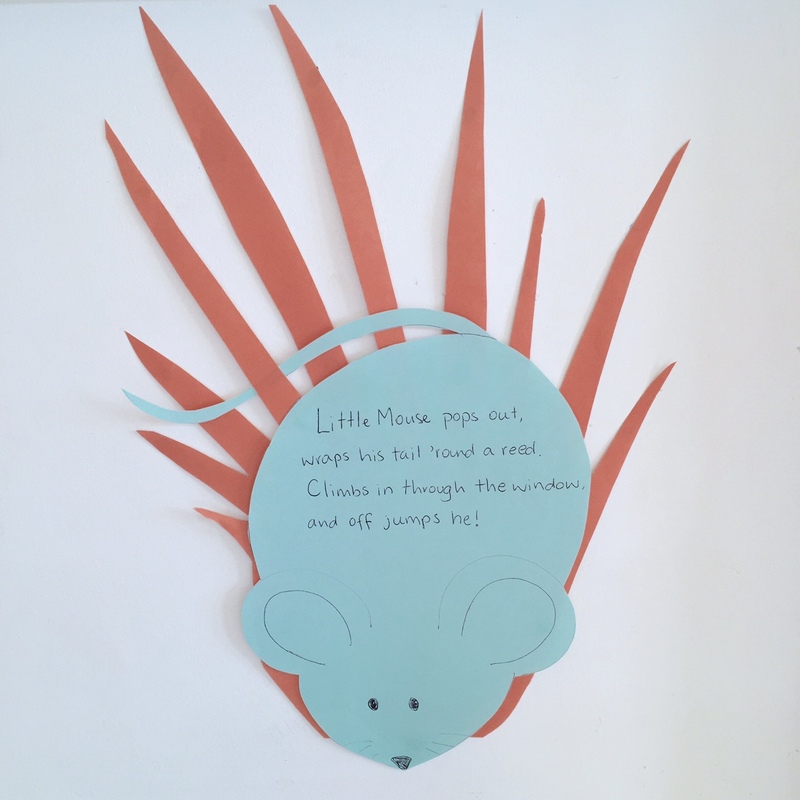 During Circle Time we have been enjoying some of <these> Summer verses and finger plays. We started off this new year of learning with a little review of our Container Story journey from last year, and picked the story back up as Mike and Bill finally reached the very top of the mountain and discovered the magic cave where they would be given the Keys of Knowledge. BR: A tastes like... Apple sauce pikelets! 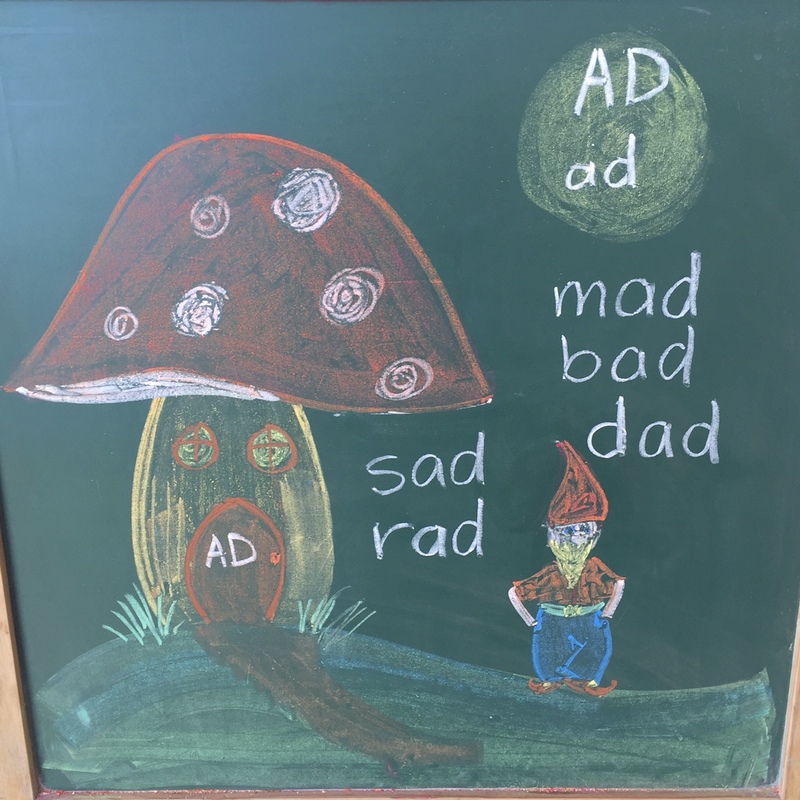 Having fun with word families. We have added a weekly Form Drawing story into our rhythm as a way to start off our formal work week each Monday morning after Circle Time. I found a wonderfully sweet (and free!) online Form Drawing story <here> which introduces a new form with each story. In their MLBs the boys practise the forms on the LHS, and do a free drawing from the story on the RHS. In Chapter 1, Straight and Curved Line forms are introduced. 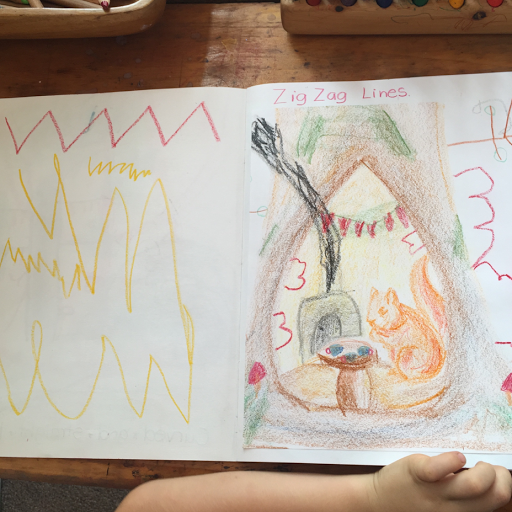 This week's Form Drawing story <here> had us practising zig-zag lines. This week's golden Key of Knowledge was the Letter E. We explored the letter in the usual ways, discovering both the long and short sounds, and used the very short Grimm's story 'The Golden Key' which can be found <here>. I must admit I found the ending somewhat annoying but the boys both loved it and really enjoyed discussing what the boy might have found in the chest. BR: E tastes like... eggs! 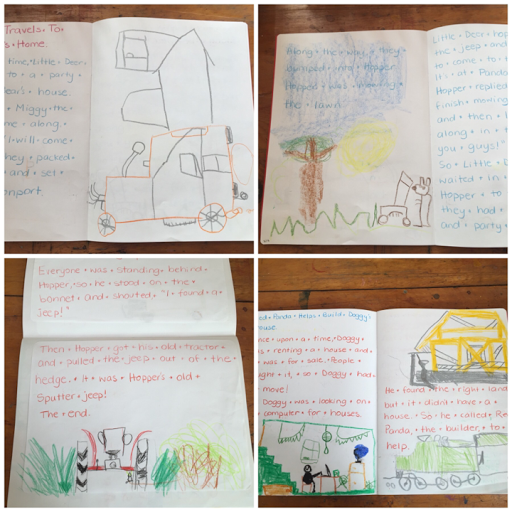 This week we put aside time to write regularly in our creative writing journals. The boys dictate the stories to me, and then illustrate them. We do a little in our books every few days. 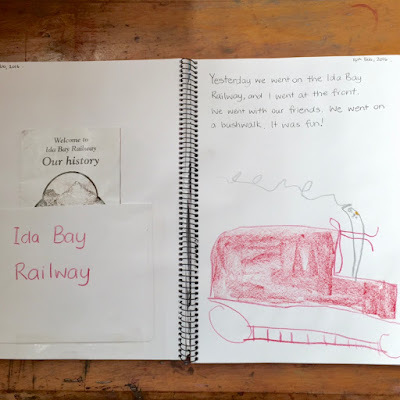 I think this is a wonderful way for the boys to easily get their own ideas and creative thought process on paper while they are learning to read and write, without the added challenge of trying to write the words themselves. Creative writing is one of their favourite activities. 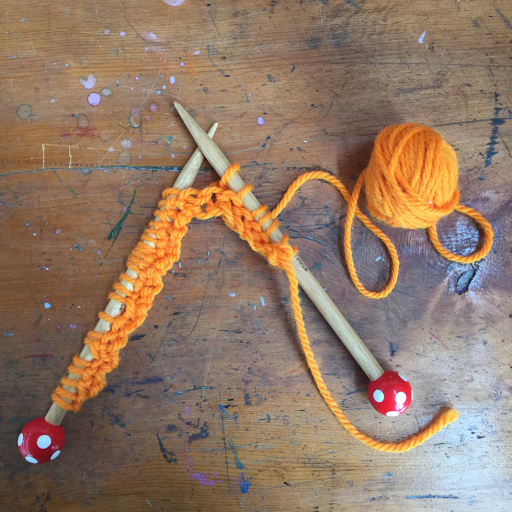 This week Mr 7 finally began to learn to knit using knitting needles! We have been finger knitting and lucent fork knitting over the last couple of years and it's only been just recently that I've felt Mr 7 is gaining the dexterity required to knit with needles. During quiet time, we listened to the sweet 3 part Martin & Sylvia audio book 'Knitting From The Beginning' which can found <here>. I also told the story of 'Jeremy & The Magic Sticks' which is found on p.162 of Susan Perrow's book 'Healing Stories for Challenging Behaviour', which is a book I'd highly recommend. Wraps his tail around a reed. Our first few attempts at knitting were a little frustrating, but with patience, practise and 3 or 4 stitches here and there, he is finally getting the hang of where hands, fingers, yarn and needles go! It really helped to have me stand behind him and gently guide his hands through the movements initially. During this week we discovered a sleepy little (nocturnal) Tasmanian Pygmy Possum fast asleep in the bookcase! We popped him outside in a dark hollow log, and as soon as he was back in the dim light he scurried away happily! 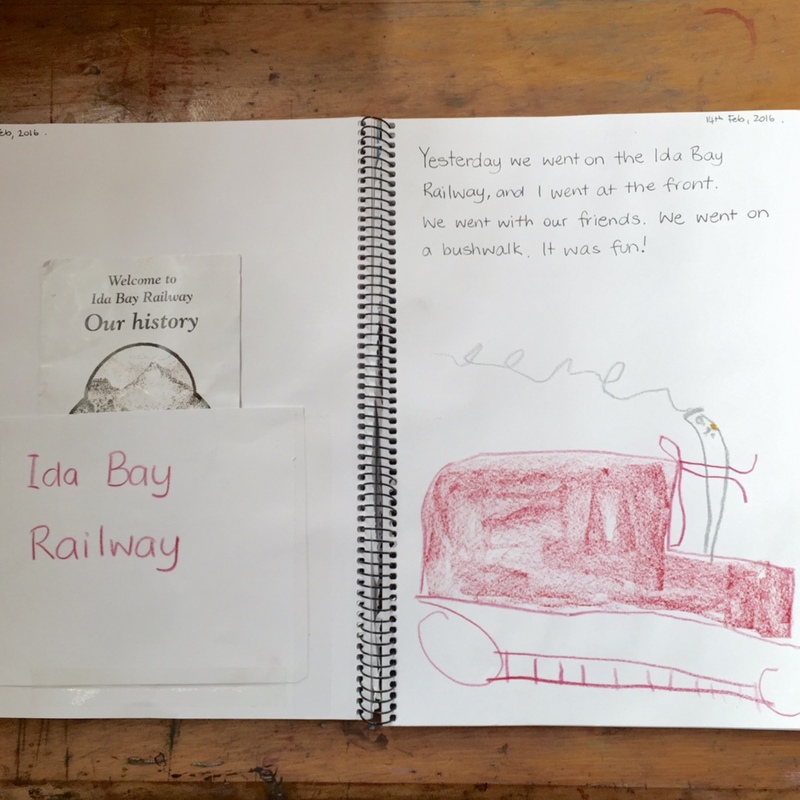 On the weekend, we went camping down at Finns Beach with another homeschooling family and the next morning joined the Huon Valley Landcare Roamers on a wonderful day on the Ida Bay Railway to learn about the native and endangered flora and fauna in the area. It was a great day in spite of the typically Tasmanian weather! 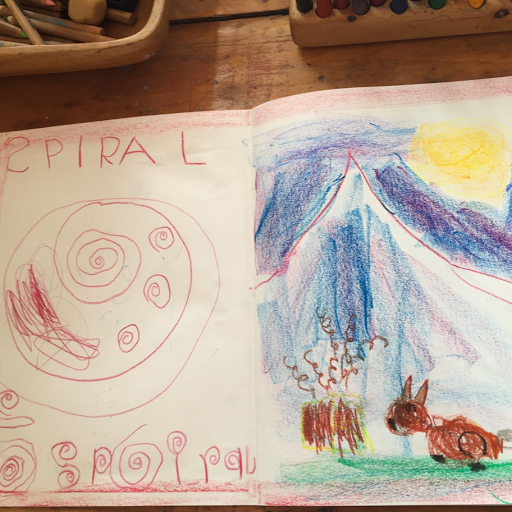 The story from this week's form, the spiral, can be found <here>. This week's golden Key of Knowledge was the Letter I. 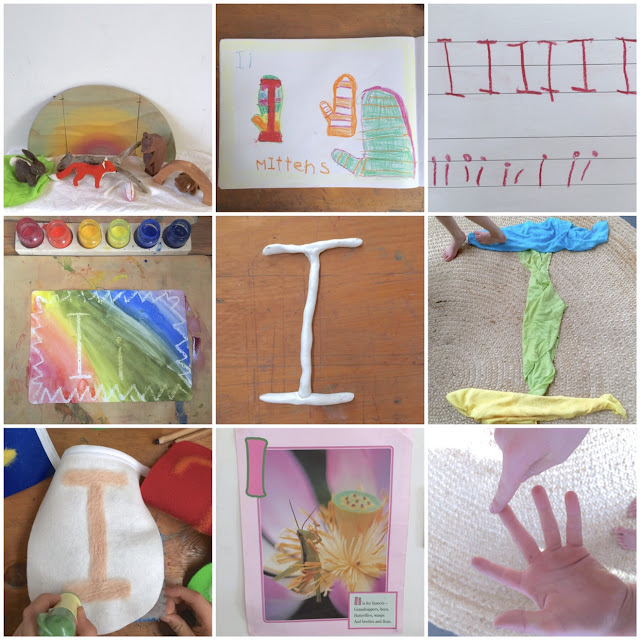 We explored the letter in the usual ways, learning both the long and short sounds for I, and used the Ukrainian folktale 'The Mitten', a version of which can be found <here>. Both boys loved this story. Earlier this week we attended our first Children of the Valley homeschool meet, which was held at a private house while the cottage was still unavailable. It was a lovely day of meeting and getting to know other Steiner inspired homeschoolers in our area, and discussion the finer details of how the homeschool group would run. The children enjoyed the day immensely and it was finished off with a magical story told by one of the very clever mamas in the group. We all are eagerly looking forward to the first 'official' meet in a few weeks time. Toward the end of this week, we all came down with the first cold and cough of the season, the first since Spring! We spent a few quiet days at home resting and recovering. 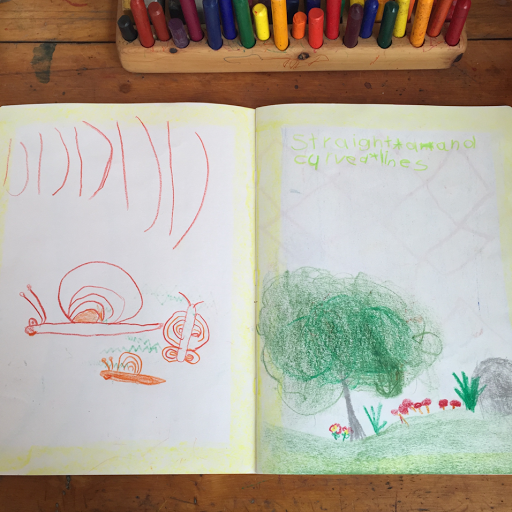 The boys both spent a lot of time drawing in their free drawing books. 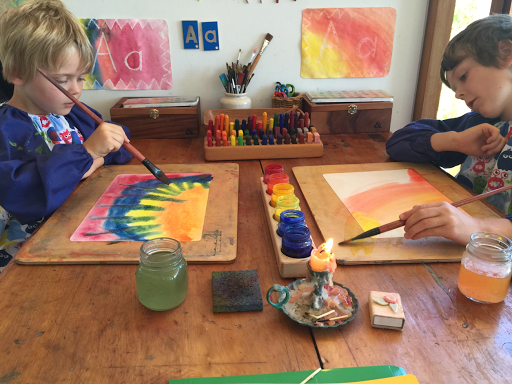 This year we have planned for a new monthly rhythm of 3 weeks homeschool and 1 week rest. 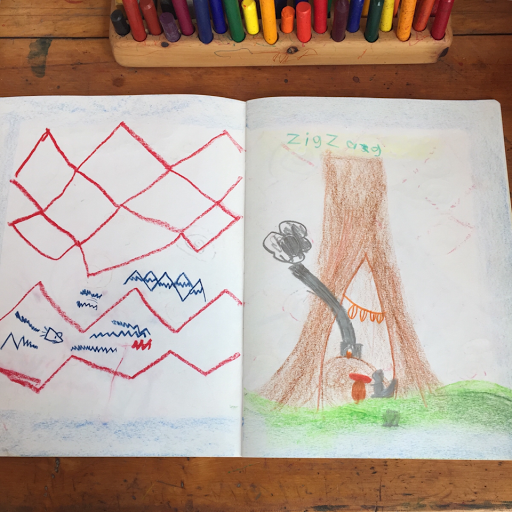 We heard about this idea from another family who have been homeschooling for many years and have found this rhythm works best for their 4 children. It is set aside as a week of rest, catch up on anything missed or haven't finished, and a time for self-directed projects. It's also an opportunity for me to look ahead to the coming month and plan some of what we will cover. This month's week off just happened to fall perfectly during our week of illness and recovery. It was so nice to have that extra 'space' planned in the month. 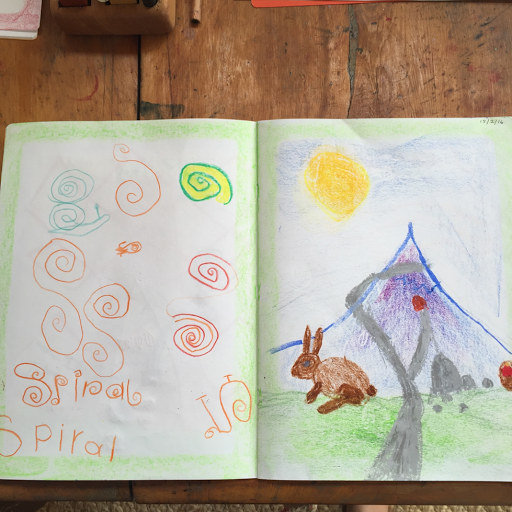 So this week's self directed activities mostly consisted of lots of drawing, painting, and writing in their Creative Writing Journals. As we began to feel better, we pottered around in the late-Summer garden, harvesting lots of tomatoes, eggplants, zucchini, potatoes, and the first of the corn! They also worked on some sweet little handwork projects. Both boys are still fascinated by the restored 'working' waterwheel powered mining rock-crusher we saw at the Beaconsfield Mine Museum last year, and decided they wanted to learn more about how waterwheels work, so we found some books and videos on the topic. And, of course, there was more time spent on electronics and on Mr 7's fabulous little circuit board kit he received for Christmas. Hello Hedi, I would love to know what your daily and weekly rhythm looks like now that you are working on first grade, and soon to be second. 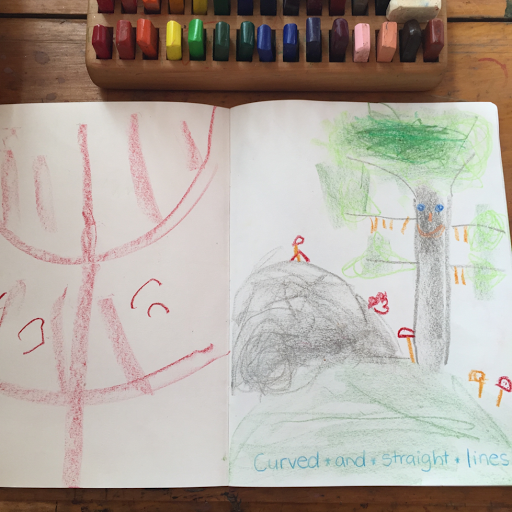 We are also homeschooling our 7 year old son and feel so fortunate to have found your blog. Thank you! !